Commemorating Democrats murdering black Republicans. 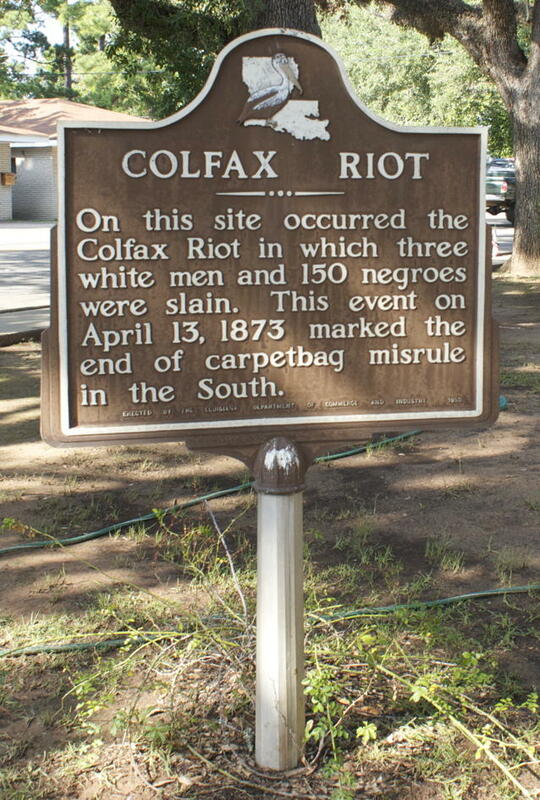 On this site occurred the Colfax Riot in which three white men and 150 negroes were slain. This event on April 13, 1873 marked the end of carpetbag misrule in the South. In this case, “carpetbag misrule” meant “blacks organizing to vote Republican”. Because that is what the blacks were there for: organizing to vote Republican and against their former Democrat masters. Democrats didn’t “oppress” black voters by giving them a photo id so that no one could steal their vote; they oppressed them by massacring them in the hundreds whenever they tried to vote. Republicans should bear no nostalgia for the Confederate battle flag. From Ford’s Theater to Colfax to The Lorraine Motel, nostalgia for the Confederacy has been used to kill Republicans. Those 153 people were Republicans. That sign is a memorial commemorating the murder of Republicans in order to perpetuate real racism. John Wilkes Booth and James Earl Ray were Democrats. Lincoln and King were Republicans. Here in Texas, Republicans did not do as Democrats would later under Lyndon Johnson, Carter, and so on. They put blacks in charge rather than in the underclass. Norris Wright Cuney led the Republican Party in Texas from 1883 to 1897. At a time when being a black Republican in the south was a lot like being a Christian under Nero. On the campus of The University of Texas, Austin, Democrats—notably regent George W. Littlefield—placed a statue of Jefferson Davis, the president of the Confederacy, on campus. Jefferson Davis was a Democrat. His citizenship rights were restored by Democrat Jimmy Carter. More importantly he was a pro-slavery traitor. Jefferson Davis has no place on a public university in the Union. He should go, and I say replace him with Norris Wright Cuney. But when the statue is removed, keep the history of why it was put there—and who put it there. It is disgraceful how long pro-slavery forces were mollified in the Democrats’ south. Confederate flags definitely do not belong flying above modern state capitols. They should be removed. I have no sympathy for anyone who wants to honor the Confederacy or those who tried to hang on to it after the war. And Republicans, who have been the target of its violence for over a century, should have no problem with this. They should spearhead the efforts to counter over a century of Democratic malfeasance and remove the trappings of the Confederacy from state sponsorship. Nikki Haley is doing the right thing. I ran across this during research it for my (unpublished) It Isn’t Murder If They’re Yankees, and used it to help the devil trick the mass murderer in the book. Democrats “oppress” black voters… by killing them en masse last modified June 25th, 2015.